Compiled and edited by Nicolae Roddy. 206 pgs. This book makes available to the general reader a number of edifying writings carefully selected from the vast collection of spiritual reflections faithfully produced and submitted for the readers of Omaha Serbian News. This collection represents half a century of Fr. 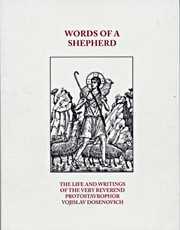 Dosenovich’s pastoral wisdom and guidance.